Today’s Seattle Times online is running an article headlined ‘Gina Haspel, nominee to head CIA, sought to withdraw over questions about her role in agency interrogation program‘. Don’t withdraw. Don’t even think about it. Please don’t. For the last 33 years you’ve done more for your country than most of the Fools on the Hill. While they were getting rich, getting drunk or high, and getting laid, you were defending our country with more loyalty, integrity, courage, and smarts than they will ever have. Unfortunately, they are stupid enough to reject your nomination and put the country at risk to score some points for their own political enrichment. They are moral hypocrites. Unfortunately, I don’t believe the attempts to reject her nomination are being made because they are stupid. Unfortunately, I don’t believe the attempts to reject her nomination are being made because the people doing so are stupid. Agreed. Stupidity is not a defense for malicious interference. The more I learn about Ms. Haspel, the more I admire and respect her. I’m curious to see how the 15 members of the Senate Intelligence Committee vote on her confirmation. 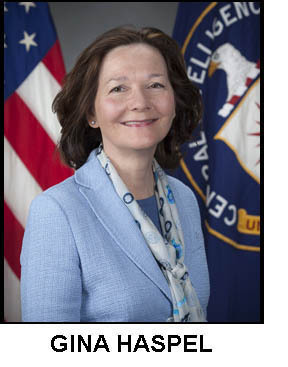 The bulk of the questions from the members concerned her involvement with “enhanced interrogation techniques” during her career at CIA. From the Congressional bios of those 15, only 1 (Senator Cotton – Arkansas) served in the military. There are 4 ex officio members, and of those 4, 2 (Senator McCain – Arizona and Senator Reed – Rhode Island) served in the military. Of those 3, only Senator McCain was a PW. I suspect that if you said “Hoa Lo” to all of them, only those who served in the military would be able to extemporaneously compare what was done there with what was done at Abu Ghraib. Senator McCain was imprisoned at Hoa Lo for 5-1/2 years.